Baga beach is one of the best beach in goa which is situated in north Goa. Baga beach is 9 kilometers away from Mapusa city and 16 kilometers away from Panaji city. This beach is major tourist spot and many tourist come in this beach. It is best place for night party. 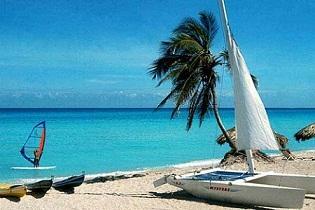 There are many activities like para sailing, kite surfing, windsurfing and ride on a jet ski. Many people say that the sand of baga beach is bountiful of some natural medicinal properties. Thats way some people scrub their body with wet sand. The swimming is very safe in baga beach because of it's sand and water, both are clean. Do not swim on Calangute Baga areas because there are life guards which didi not swin to anybody. Baga beach is best place for swimming. The Baga beach shacks serve wide variety of food including Goan cuisine of fish, curries and rice. You can also find night market on Saturday and Anjuna market on Wednesday. First reach the Thivim railway station and take a taxi. Any cab driver will know this destination. If you are outsider of Goa state, then you have to reach the Goa Dabolim airport and it is 50 KMS away from Baga beach. Read: Which places to visit while in Goa? The beast time to visit in Baga beach is November/December and you can see a lot of crowd in October too. Feb to March are kind of dry season. June to August are rainy season and many people may want to avoid beaches during rains. During December and new year days, the beach will be really crowded. If you hate crowd, stay away from this place during Christmas and New Year holidays. I visited Baga beach in November and it was pretty crowded. One of the reasons I visit beaches is to sit and relax. But that wasn't the case there. Too many people and too many sellers. I want calm and quiet beaches!